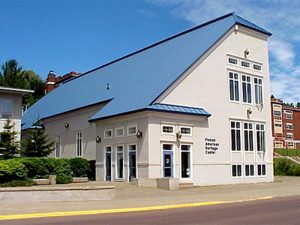 The Finnish American Heritage Center hosts cultural events, an art gallery and North American's most renowned archive and collections meant to preserve and promote Finnish-American identity and history. Since its grand opening in 1990, Finlandia University’s Finnish American Heritage Center has become a community focal point and a national center, offering a multitude of exhibits, lectures, plays, musical programs and community events each year. The building is a popular stop for tourists and the beautiful Martha Wiljanen Community Hall is available to the public as a rental space. Finnish immigrants dreamed of an institution that would provide religious education, perpetuate the Finnish language and preserve their experience in North America. Suomi College (now Finlandia University) built in 1896, is the realization of that dream, and the only remaining North American institution of higher learning founded by Finnish Americans. We invite you to explore everything we have to offer, and encourage you to help us fulfill our mission by donating money to the Finnish American Heritage Center. The Heritage Center is open Monday – Friday, 8 a.m. to 4:30 p.m. The Finnish American Heritage Center is the primary site of the Finnish American Folk School (FAFS). Through the creation of an inter-generational, multi-national Finnish folk school at the Heritage Center (and nearby satellite sites) we develop, over the course of a three-year cycle beginning in 2017, a sustainable system through which Finnish cultural traditions are learned by folk school attendees and subsequently taught by those attendees to future generations. In its initial years, the folk school will be structured along themes that mirror (but not limited to) the experience of Finnish immigrants to America. Year one’s theme will be centered around boats, representative of the method of travel used by immigrants, but also metaphorically and symbolically representative of other aspects of Finnish folk culture. Year two shall focus on log construction – how the immigrants built their new homes and communities — with primary focus on the traditional Finnish sauna and the multitude of ways it’s connected to Finnish folk culture. Year three will center on how folk traditions in handcrafts and other entertainment fulfilled the immigrants. Music will be an underlying theme all three years, and all three years will incorporate other elements of Finnish folk tradition instruction. Finnish folk traditions will be taught by experts in the particular tradition, in a hands-on, interactive manner whenever the subject matter is conducive to that style. Other methods of tradition sharing will include, but not be limited to lecture/presentation style settings, demonstrations, performances and exhibits. These activities will include boat building, tar making, musical instrument making, log construction, paint making, dancing, weaving and other handcrafts, art exhibits and numerous other possibilities. Ultimately, these visiting artists will train our local artists, and as a result our local artists will be equipped to become our new tradition bearers – our “go-to” people as we continue programming into the future. The activities shall take place at times when the Copper Country traditionally hosts Finnish culturally-themed festivals: Heikinpäivä (January), Juhannus/Midsummer (June), and Ruska (September).